Everest sunrise view Trek- 12 days is a moderate trek. Travelers who can walk up to 6-7 hours a day on an uphill and downhill trail will find this trek fulfilling. It is best that we prepare ourselves for the Annapurna trek by jogging and exercising regularly at least a month prior to the start of the trek. Trekking to the Everest Base Camp should be relatively easier for those who have experience walking/trekking in a high altitude environment. Past hiking experience would be an asset but no technical skill is required for this trip. It is also important that we consult our doctor. Participants with pre-existing medical conditions such as heart, lung, and blood diseases should inform Discovery Mountai Trek before booking the trek. 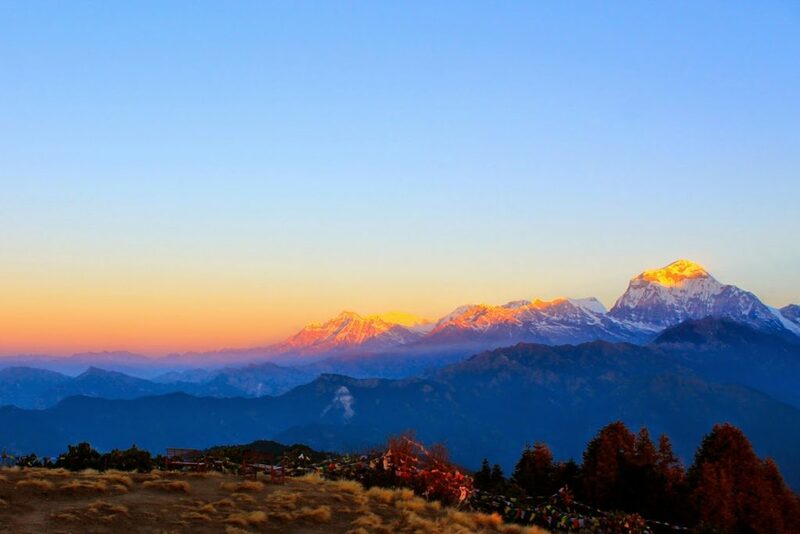 The best time to trek to the Everest sunrise view Trek is Spring (February to May) and Autumn (September to November). The temperature is moderate in these seasons and guarantees amazing views through the trip. Although this trek can be undertaken during winter, the cold temperature might not be suitable for everyone. True to its name, the Everest View Trek is all about the Everest panorama. We begin our 12-day trip in Kathmandu with visits to UNESCO World Heritage Sites before heading to the most coveted region in Nepal. On our trek, we also reach the Tengboche Gumba which is situated at 3860m and is the largest monastery in the Khumbu region of Nepal. From here, the panoramic views of the Himalayas of Nepal including Tawache, Nuptse, Lhotse, Ama Dablam, Thamserku and Everest are ours to admire. The Everest View Trek features a wide range of panoramic mountain scenery of Nepal combined with unique cultural encounters with the Sherpa people and their rich culture which is closely tied to Buddhism. This trek is ideal for anyone who wishes to enjoy the surreal beauty of the Nepalese Himalayas and Everest in particular while also enjoying an easy trek. Our trail passes through a pine forest and we continue our walk on the trail that goes north up the Benkar valley. We cross Dudh Koshi River and pass Chumoa and Monjo villages before reaching the entrance of the Everest National Park. Then after crossing a suspension bridge, we pass Jorsale village and walk alongside of the Dudh Koshi and Bhote Koshi rivers. We ascend on a steep trail and reach Namche Bazaar which is probably the biggest town in the Everest region. 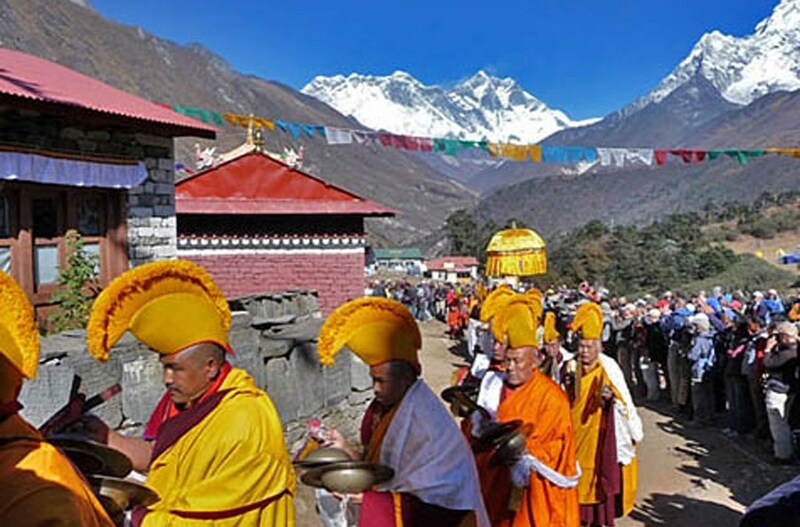 We can tour Namche Bazaar which is the primary town of the Everest or Khumbu region and has government offices, ATMs, internet cafes, shops, restaurants, and a colorful market. We can hike-up to Sagarmatha National Park and enjoy the sunrise over the Himalayas including Mt. Everest, Lhotse, Nuptse, Ama Dablam, Thamserku, Kongde and so on. If we are interested in a day hike, we can trek to Khumjung village. Today we also visit the Hillary School and a monastery which houses a yeti scalp! Today’s journey starts with a climb up to the famous airstrip at Syangboche. Just above the airstrip is the Everest View Hotel from where we can enjoy an up-close view of the mighty Everest. We continue trekking to Khumjung village which is surrounded by Kondge, Thamserku and the sacred Khumbila mountains. While here, we visit the Edmund Hillary School and Khumjung Monastery (a monastery famous for housing the head of the Yeti! From Tengboche, a steep descent of about 1500ft/500m will take us through rhododendron bushes and fir trees to the Dudh Koshi River. We continue on our trail and pass Tashinga and Sansa villages before reaching Kyangjuma. While here, we get to appreciate spectacular views of Ama-dablam, Thamserku, Nuptse, Lhotse and Everest. We walk ascend and descend on winding trails followed by another walk through a forest until Namche Bazaar, then we walk on a rocky terrain, It is mostly a downhill trek on a trail alongside the Dudh Koshi River. We cross several suspension bridges, pass by several monasteries and villages before reaching Phakding. We began our trek by crossing the first suspension bridge today, it is mostly a uphill pass by several villages, after reaching Lukla we spend rest of the day taking rest and today we will be our last day on the mountain with our staff. We catch an early morning flight to Kathmandu after our long mountain journey. After reaching Kathmandu, we can take a rest or do some souvenir shopping. There will be a farewell dinner in the evening to celebrate the successful completion of our journey.